The villa only overlooked by palm trees! 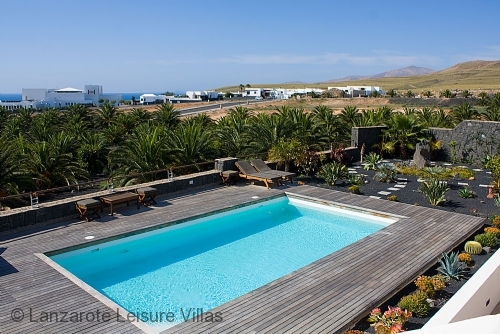 Buena Vida is a stunning luxury villa in Puerto Calero, close to the beautiful marina and waterfront bars and restaurants and only a 10 minute drive from the much larger resort of Puerto del Carmen. 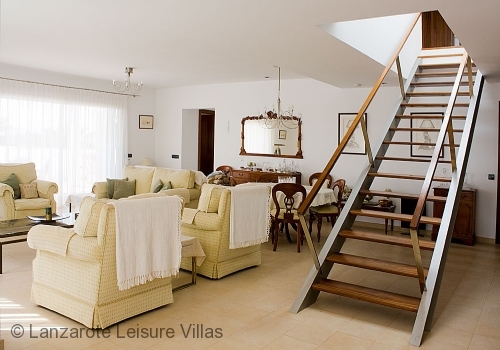 This spacious villa has two floors of sleeping and living accommodation making it perfect for two families. The upper floor accommodation is through the main entrance at street level where there is a huge modern style open plan lounge/diner with leather sofas and views of the terrace and sea. 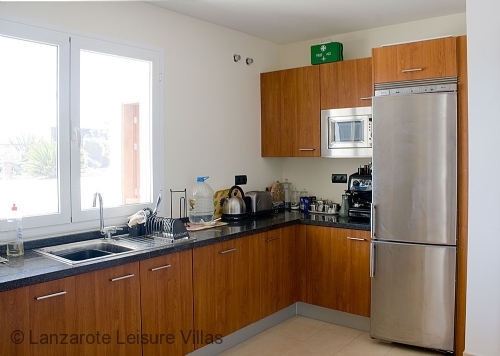 The large main kitchen and utility room is here also with all mod cons. 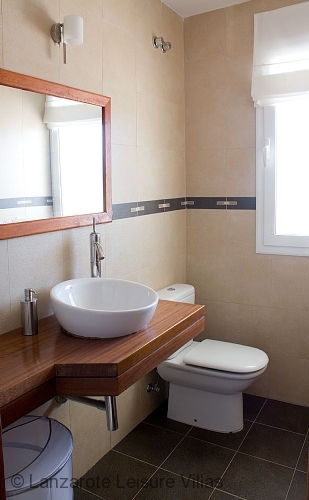 There is a cloakroom, family shower room and two double bedrooms with a Jack & Jill bathroom between. 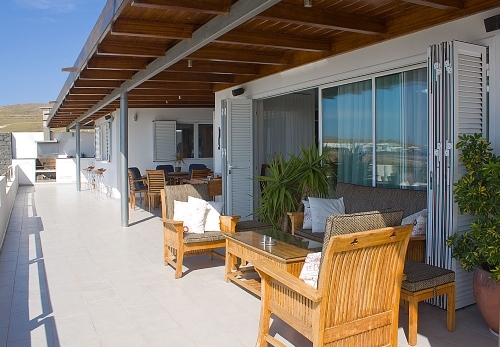 Out to the covered terrace where there's lots of quality, comfortable furniture for relaxing and admiring the wonderful panoramic sea and mountain views. Fantastic built- in barbecue area includes an open, but covered, kitchen containing fridge, wine cooler, dishwasher and units full of crockery, cutlery, etc. - everything you need for a wonderful outdoor dining experience. The lower level can be entered down a flight of external stairs and through its own front door or down from the main lounge. This level mirrors above with a spacious lounge/diner this time in a classic style. Another fully fitted kitchen. 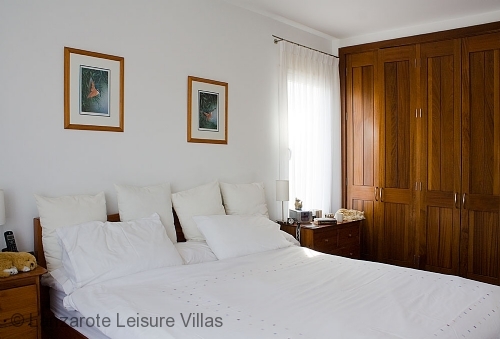 Two twin bedrooms, one has an en-suite shower room and the other an en-suite bathroom. Through the patio doors and out to another covered terrace the full length of the villa and looking out over the pool. This super heated pool with an automatic pool cover is 9.5m x 4.5m in size and 1.5 metres deep throughout. Surrounded by decking and planted garden areas it also has a separate sunken 6 person jacuzzi. 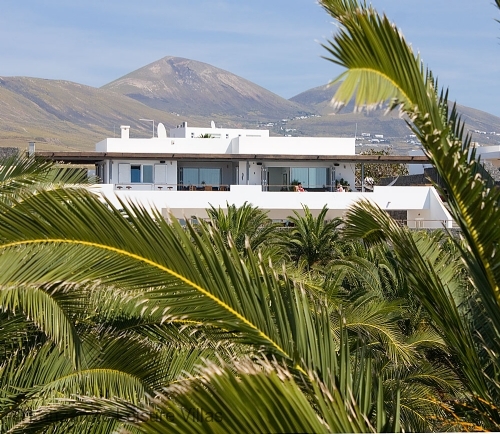 Beyond the pool is an area of Canarian palm trees offering a vista of green with the blue of the sea beyond. 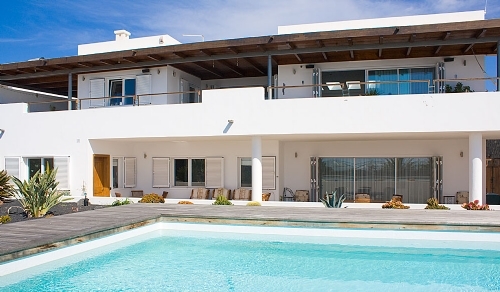 This magnificent villa has the added bonus of an intercom entry, two security safes, free WiFi, pool towels and a welcome food pack. 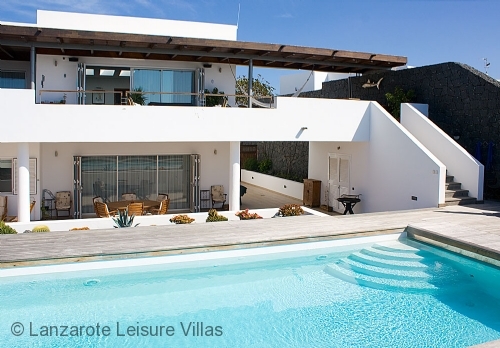 Stay here, relax and enjoy your surroundings - you won't want to leave the villa. If you have to, the lovely marina at Puerto Calero is only a 10 minute walk or a few minutes drive away. De derde keer op het eiland beviel ons het beste. Puerto Calero is een mooi en rustig stukje waar je in tegenstelling tot de meeste villaparken wat meer ruimte hebt tussen de huizen. Dus geen 20 blokken met identieke huizen naast elkaar. Het huis was groot met maar liefst 83 zitplekken. Genoeg ruimte dus voor een grote groep, alleen zou je de slaapkamers en bedden dan moeten delen. We kwamen de eigenaren van het huis tegen in de woning toen we aankwamen. Dat was niet gek omdat we toestemming hadden gekregen om om 09:00 aan te komen in plaats van 14:00. Steve gaf ons een rondleiding in het huis en raadde ons enkele locaties en restaurants aan. Je hebt hier echt de rust en ruimte om te ontspannen waarbij je je niet hoeft te ergeren aan de geluiden van buren. De jacuzzi en het zwembad waren top! Ook de keuken (de bovenste van de twee) was goed uitgerust met alle nodige keukenspullen. Het enige is misschien dat er geen airco is in huis. We hebben zelf geen last gehad van de warmte omdat het 's avonds snel afkoelt buiten en in huis (ook al was het iedere dag overdag 30 graden en volop zon). Maar voor mensen die daar gevoelig voor zijn is het iets om rekening mee te houden. We zouden hier graag nog eens terugkomen! The third time on the island best suited us. 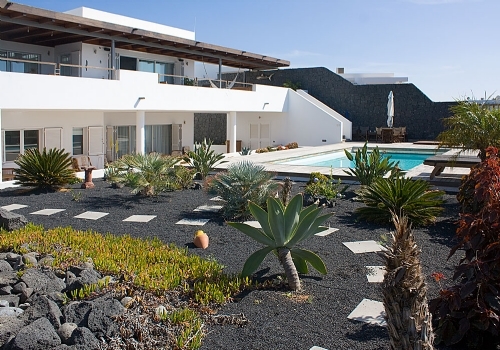 Puerto Calero is a beautiful and quiet part of town, unlike most villages, which has more space between the houses. So no 20 blocks of identical houses next to each other. The house was large with no less than 83 seats. Enough room so for a large group, only you should share the bedrooms and beds. We encountered the owners of the house in the house when we arrived. That was not crazy because we were allowed to arrive at 09:00 instead of 14:00. Steve gave us a tour of the house and recommended us some locations and restaurants. You really have the peace and space to relax, so you do not have to annoy the noise of neighbors. The jacuzzi and pool were top! 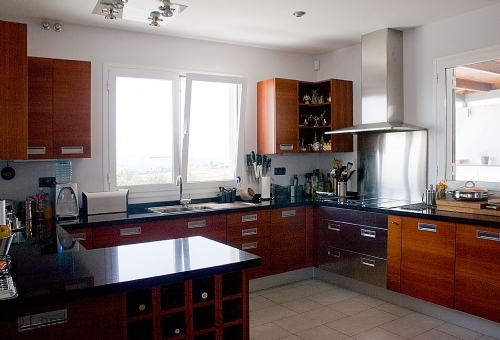 Also the kitchen (the top of the two) was well equipped with all the necessary kitchenware. The only thing is that there is no air conditioning in the house. We did not suffer from the heat itself because it cools down quickly and in the evenings (even if it is 30 degrees and plenty of sunshine every day during the day). But for people who are sensitive to it, it is something to keep in mind. We would love to come back! Lovely large villa with a sea view. Lots of space to relax in and only 10min walk from the marina. Good facilities and layout too. 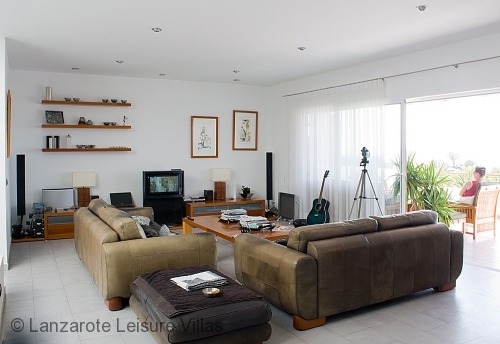 This was an excellent family viila, very peaceful with only a short walk to bars and restaurants. 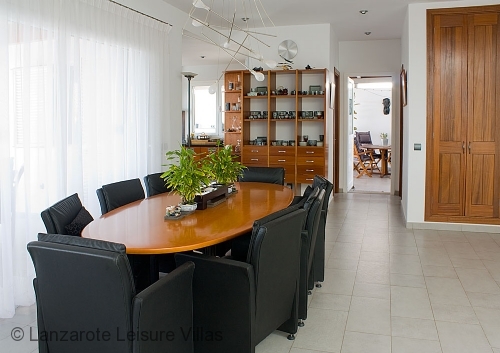 And also a short taxi ride to Puerto del Carmen which offers many more amenities. Steve & Helen the owners were happy to share places to visit and recommended some good restaurants to eat in. This is a great place for a family holiday, the kids loved the pool and floats and pool games all provided. The jacuzzi was also a big hit. 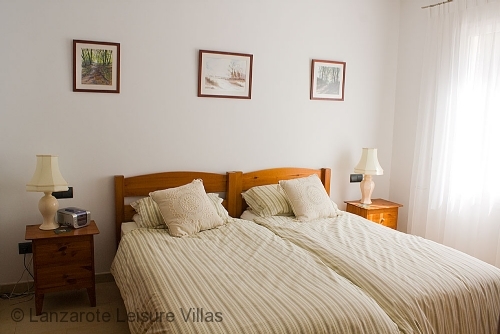 Puerto Calero is a quiter resort and ideal for families. We hired a car and getting round the island was easy. Longest teavel time for where we visited was 30 mins max. We would recommend this viila and would have no hesitation in returning. Highly recomended. Puerto Calero, which is 10 minute walk away is an exclusive resort with a marina, restaurants, bars and designer boutiques. A great place to shop, wine, dine and relax. The nearest beaches are in Puerto del Carmen about a 10 minute drive away or you can go by boat to the natural Papagayo beaches. Playa Blaca, a lovely beach at the southern-most tip of Lanzarote, is a 23 minute drive. Great choice of restaurants overlook the marina. 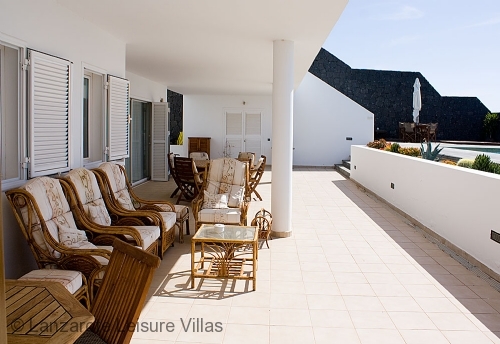 A 10 minute drive to Puerto del Carmen and you will have even more choice. 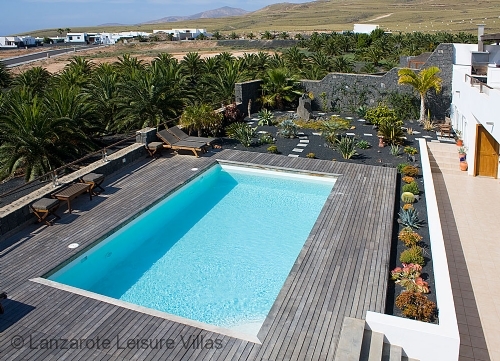 Nearest one is Lanzarote Golf in Puerto del Carmen - less than 10 minutes by car. Puerto Calero is approx 13 mins drive from Arrecife airport, 10 mins drive to Puerto del Carmen and 23 mins drive to Playa Blanca. Pool cover is automated and there are steps for entry. The rates above are for the number shown for a one week stay. 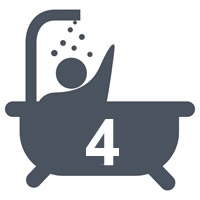 Rates for the odd durations or dates that fall into more than one price band can be found by selecting your dates and numbers occupying in the search availability box. Alternatively contact us by email or phone and we will be happy to quote the rate. 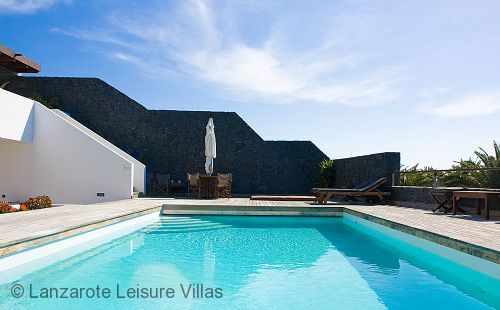 Prices including the pool electrically heated from November to April inclusive. Deposit to confirm is 25% with the balance due 2 months before travel. Bookings made within 2 months of travel are full payment.